Malawi Cichlids are relatively hardy, but they are still vulnerable to diseases. The main reasons for disease are poor water quality and stress. As an fishkeeper, you should be prepared to get into routine for weekly water changes. It is essential that you feed your fish the correct diet as their digestive systems are not suitable for certain foods, particularly those that are protein-rich. Checking your fish regularly is also good practice. If you notice something, a good response is to do a quick water change, and seek help on a forum. It may also be best to remove the fish into a quarantine tank, to prevent a contagious disease from spreading to your other fish. Superfix and Octozin are two medications worth have in your tank cabinet; Superfix for external problems and Octozin for internal diseases. 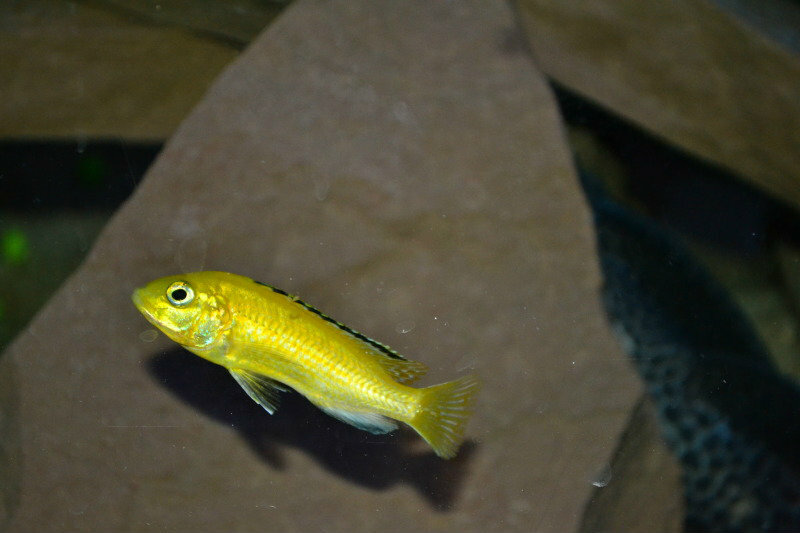 African Cichlids, most notably Mbuna, have a vegetarian diet. Their long digestive systems are not suited for protein-rich foods, which can result in blockage: Malawi Bloat. Signs of this disease include a swollen stomach, quick breathing, reluctance to eat food, clear excrement and a lethargic appearance at the bottom of the tank. The disease will damage the fishes' internal organs, such as the liver, kidney and swim bladder, and will result in death after a few days. A poor diet and water quality could cause this disease. You should tackle it by a 50% water change, adjustment to their diet, and adding Octozin to the water. Examine the other fish in the tank to make sure it doesn't spread. This disease is contagious and deadly. The trademark sign of this is the sunken stomach, but a loss of appetite (they may pick up food and spit it back out) and a weak appearance are other symptoms. If you think your fish has skinny disease, remove it into a quarantine tank as soon as possible to prevent the disease from spreading. fashion as Malawi Bloat; it is worth noting that both of these diseases are hard to treat, as once the symptoms are visible, the disease is usually quite well developed. bottom of the tank and perhaps even just floating on the top of the water. This disease is, again, caused by a poor diet, which results in intestinal blocking, in turn damaging a lot of the internal organs. Prevention is better than cure: avoiding protein-rich foods, maintaining a good water quality, and increasing vegetable intake such as peas, cucumber and garlic will all help to keep these diet-related diseases at bay. Octozin is a good medicine to tackle these internal diseases. This is a very contagious disease in the tank, and can often attack a new tank that has yet to have an established bacteria colony. This is easily identified: the fish will have a white or grey colouring of the skin, often accompanied by damaged fins. The disease is a fungus which can grow on leftover food or dead fish that aren't removed. Keeping on top of this and not over-feeding your fish will help to prevent this disease. Cotton wool disease can be treated by external, fungicidal medication, such as Superfix and Protozin. Hole-in-the-head disease, also known as hexamita, has symptoms such as a loss in appetite and weight, and small depressions on the head (the namesake). Like other African Cichlid diseases, poor water quality and poor diet are to be blamed for this. Fish that suffer from this disease generally have insufficient vitamins C and D; an increase in vegetable-based foods such as peas, cucumber and garlic would be a welcome addition to their diet. A water change to make sure water quality is ideal would also be beneficial. Fish with whitespot look like they have little white spots on them, and the may scratch excessively against objects in the tank. The parasite, Ich, grows on a fish, which then falls over, reproduces and can swarm to attach to fish. Without a host, these parasites will die within 3 days. To treat, you should add Protozin to the water to kill free-living parasites. Increasing the water temperature to 30°C will decrease the lifespan of the Ich. This is also worth noting with Malawi Cichlids. These are very aggressive fish, and excessive bullying of an individual can result in damaged fins and skin, stress and also disease. It can easily result in death if left to grow. If a fish is clearly needing a break, it is best to separate it from the others and treat to regrow the fins and allow the fish to recover. Melafix is a good antibiotic treatment to help the fish recover. Finrot can follow when the fishes' fins are damaged. Separating the fish from bullies and fin-nippers will allow them to recover and grow their fins back. Antibiotic treatment may be necessary to speed up the process. Treatments for African Cichlid diseases do exist; useful ones I haven't mentioned in this post are Waterlife, Protozin, Haloex and Kirsho wormer. However, as the old saying goes, 'prevention is better than cure'. Making sure that you're feeding your fish the appropriate diet, as well as doing frequent water changes to keep your water quality good, should keep your fish healthy and these diseases at bay.